The Amalfi Coast and the coastal road Amalfitana south of Naples. The Amalfi Coast is a very famous stretch of coast south of Naples in Italy. It is considered to be one of the most beautiful coasts of Italy, for some people it is even the most beautiful coast in the world. At least the Amalfi Coast is one of the most visited tourist attractions in the region Campania in the south of Italy. It is a steep coast with narrow, small, picturesque villages. Very well known is the road along the Amalfi coast. It is partly so narrow that one has to drive backwards at oncoming traffic. By car, it takes 1.5 to 2 hours to drive the 40 kilometres along the Amalfi Coast, the buses sometimes even longer. In Italian, the Amalfi Coast bears the beautiful name „Costiera amalfitana“. The famous street is called „Amalfitana“. 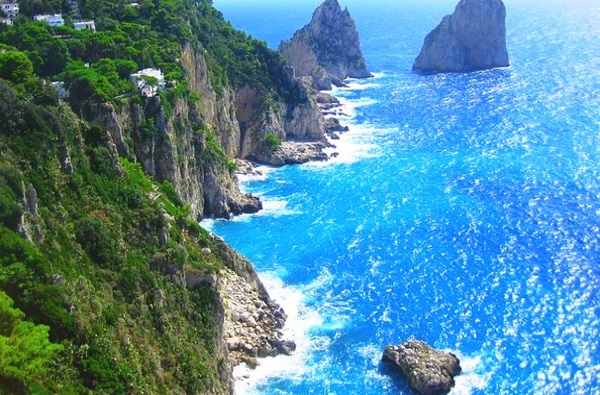 The coast is named after the historically most important place of the coast Amalfi. Today the people on the Amalfi coast live mainly from tourism. But also the cultivation of wine and citrus fruits (especially lemons) is a big economic sector. The main town Amalfi is about in the middle of the almost 40 kilometres long Amalfi coast. Once Amalfi was an important maritime power, today it has only 6.000 inhabitants. The second most important place on the Amalfi Coast is Positano, one of the most beautiful places in Italy. 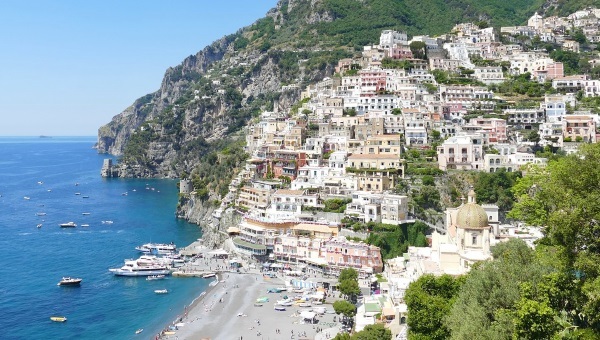 Positano, in the west of the Amalfi Coast, is built on a steep slope (see picture). The famous coastal road Amalfitana runs above the village. Those who arrive by bus have to change to another bus or taxi at an intersection or walk a long way. Ravello is also beautiful. 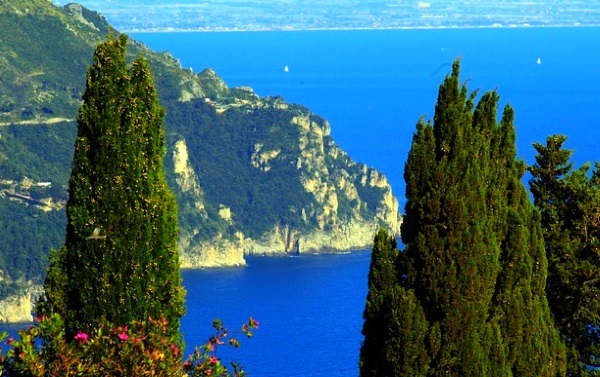 The village is situated above the Amalfi coast with a wonderful view of the cliffs and the sea. The famous road Amalfitana is a real experience. The road is so narrow that you have to avoid oncoming traffic. There is hardly any possibility to park and take photos. Parking is also difficult and expensive in places like Amalfi. It is better to take the bus or the ferry. The Amalfi coastal road is served by scheduled buses on the Sorrento – Amalfi and Salerno – Amalfi. If you want to travel the whole Amalfi coast by bus, you have to change in Amalfi. From Sorrento to Salerno it takes 4 hours (about 50 kilometres). The fares are very low (whole route Salerno to Sorrento about 5 euros in 2019). The buses run about every hour. Between Positano, Amalfi and Salerno there are also many much faster ferries.